Aleksa Palladino and Devon Church had a fortuitous meeting on a train in Canada when they were 18 years old. Their chance meeting sparked a whirlwind courtship, eventual marriage, and the genesis of their creative relationship as Exitmusic. Passage, the band’s debut full-length album, grants admission into the couple’s secluded Inception-like world they’ve collectively built that is both escapist and pragmatic. The world of Exitmusic is colored in black and white where beautifully creepy vocals starkly contrast against a menacing soundscape. 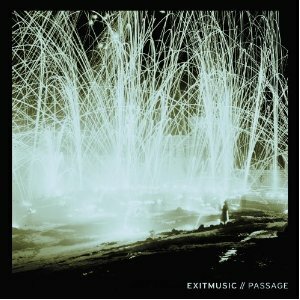 Even the track names on Passage act as little guideposts demarcating points of light as Exitmusic’s subconscious exists in limbo. On “City,” Palladino’s androdgynous vocals twist and turn with varied trills and modulations in pitch enveloping her in raw emotion leaving her almost breathless and vulnerable. Passage borders on feeling a bit melodramatic with the rapid rise and cessation of multiple layers of guitars, drums, and keyboards but there’s no denying the evocative nature of Palladino’s voice. Close your eyes and enter the world of Exitmusic.